Chinese President Xi Jingping and his Turkmen counterpart Gurbanguli Berdymukhammedov opened a giant natural gas field in Turkmenistan that will vastly increase the ex-Soviet nation’s energy supplies to Beijing, Turkmenistan media reported Wednesday. 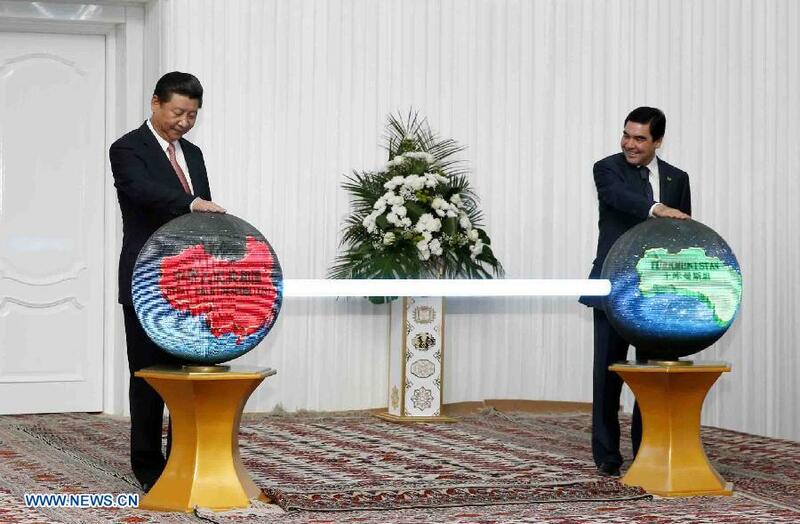 Turkmenistan is now, by a great margin, China’s largest foreign supplier of natural gas: over 21.3 billion cubic meters (bcm) in 2012, or 51.4 percent of imports, according to data published by the BP Statistical Review of World Energy. That’s about three times more than Qatar supplies China (see chart). And the number is set to skyrocket with the opening of the giant Galkynysh field this autumn, which will also feed the 1,833-kilometer Turkmenistan-Uzbekistan-Kazakhstan-China pipeline. EU countries such as Austria, Bulgaria, the Czech Republic, Estonia, Finland, Latvia, Lithuania, Poland, and Slovakia all depend on Russia for over 60% of their gas imports. In addition, countries aspiring to be EU members such as Moldova, Turkey, and Ukraine rely on Russia for over 65% of their imports. But while China has moved swiftly to source supplies from Central Asian states of Turkmenistan, Kazakhstan and Azerbaijan, Europe has been distracted by a crippling economic recession. 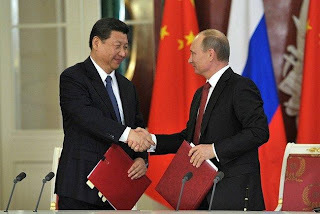 Russian gas giant Gazprom and the China National Petroleum Corporation (CNPC) signed the basic conditions for the long-term deal to supply at least 38 billion cubic meters of Russian gas a year to China. Gazprom said the deal is expected to be finalized by the start of 2014. The project envisages the construction of a new Russian pipeline to China by 2018. "The Eurasian region is stable on the whole. Yet, local turbulence and terrorist activities happen from time to time," Li told the forum on Monday. "Faced with such threats which are often transnational, no country can stay immune. Cooperation among all countries is the only viable way to uphold regional security." In the next five years, China will import goods worth $8 trillion from Asia and Europe, and will invest over $450 billion in Asia and Europe, Li said. The comments by Li Wei comes amid recent reports which suggested India’s concerns relating to the project as it runs through the disputed Pakistan-occupied-Kashmir (PoK). 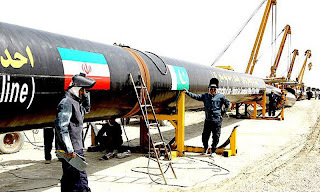 Pakistan has refused to participate in talks with India on the Turkmenistan-Afghanistan-Pakistan-India (TAPI) gas pipeline, following the increased tensions between the two nations over ceasefire violations in border areas of Kashmir. The Express Tribune reports that the TAPI pipeline dialogue has been postponed after Pakistan refused to attend the meeting in India on August 22. Islamabad will complete IP gas pipeline project: Pakistan min. Pakistani minister of petroleum and natural resources has stressed the importance of the multi-billion-dollar pipeline projected to carry natural gas from Iran to its eastern neighbor, stating that Islamabad will complete the project regardless of any domestic or foreign pressure. Pakistan, India, Afghanistan and Mongolia are expected to become full members of the Shanghai Cooperation Organization (SCO) at its next summit, said former Secretary General of Ministry of Foreign Affairs Akram Zaki on Wednesday. Speaking at an international conference entitled “SCO’s Role in Regional Stability: Prospect of Its Expansion” organized by Islamabad Policy Research Institute here, Akram Zaki said China and the Russian Federation had supported Pakistan, India and other countries’s membership of the SCO. Pakistan, which has an observer status at the SCO, a key regional security organisation, is sending the Prime Minister’s Adviser on National Security and Foreign Affairs, Sartaj Aziz, to take part in the summit. However, in view of the likely military strike against Syria as well as the US drawdown in Afghanistan next year, Moscow is pushing Islamabad to send Prime Minister Nawaz, officials told The Express Tribune. Afghanistan's police and army are losing too many men in battle, and may need up to five more years of western support before they can fight independently, the top US and Nato commander in the country has told the Guardian. Dunford admitted that Nato and Afghan commanders are concerned about Afghan casualty rates, which have regularly topped more than 100 dead a week. "I view it as serious, and so do all the commanders," Dunford said. "I'm not assuming that those casualties are sustainable." The governor of the northern Afghan province of Badakhshan on Tuesday escaped a bomb attack in which four of his bodyguards were dead, said a provincial government spokesman. Today Russia has marked the Day of Solidarity in the Fight Against Terrorism. 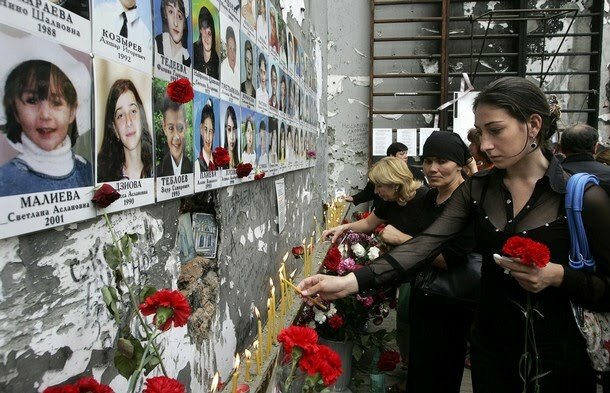 On this day the country remembers the victims of the Beslan tragedy, during which more than 300 people were killed, most of whom were women and children. On September 1st, 2004, during a celebratory line-up, terrorists stormed Beslan's School Number 1. A group of armed people held adults and children in the school for three days. 334 people were victims of the tragedy, including 318 hostages, 186 of whom were children. According to the Interior Ministry, a home-made explosive device made of a 3-litre plastic bucket with a 200-gram TNT block, an industrial detonator ID-8, striking pieces, a grenade, cartridges and other components for a home-made bomb were found in the bags. Meanwhile, the ministry noted that a piece of paper with a schematic view of the Buinaksk school was found. In the evening on September 1, a police patrol came under fire in Buinaksk. A policeman was wounded, an attacker was killed, the second attacker escaped. The Chechens had been recruited in Europe by Georgian Interior Ministry officials, brought to Tbilisi, and trained over a period of several months in the use of weaponry with the intention of enabling them to cross the border from Georgia into Chechnya to join the ranks of the Islamic insurgency. In addition to the young Chechens living in exile in Europe, the organizers of the operation also recruited several Kists (Georgian Chechens) from the Chechen community that has lived for several centuries in Georgia’s Pankisi Gorge. "The Chechens had been recruited in Europe by Georgian Interior Ministry officials, brought to Tbilisi, and trained over a period of several months in the use of weaponry with the intention of enabling them to cross the border from Georgia into Chechnya to join the ranks of the Islamic insurgency. In addition to the young Chechens living in exile in Europe, the organizers of the operation also recruited several Kists (Georgian Chechens) from the Chechen community that has lived for several centuries in Georgia’s Pankisi Gorge." Moreover, witnesses suggested that this was not an isolated event. Apparently, bearded men from abroad had been arriving for some years, and by 2012 as many as one hundred and twenty militants had received support. Nanuashvili’s report indicates the existence of a secret programme, run by officials of Georgia’s previous UNM government, to arm and train Chechen and Islamist militants. Ex-president Saakashvili has rejected the allegations, pointing out that they tallied with Russian claims. While a number of former officials have attacked the Ombudsman’s report, some have corroborated it.